#givingtuesday is the global day of giving that follows Black Friday and Cyber Monday, as a day to give back. Ruth Cadbury MP was in Parliament to celebrate the great things that are achieved by charities every day. This is the fourth year #givingtuesday has taken place in the UK, a campaign which encourages people to 'do good stuff' for charity. Over 2,000 charities and businesses have signed up as partners in the campaign including Cancer Research UK, The Big Give, Royal Bank of Scotland, Morrisons, Sainsbury's, the Co-Op and Radley. Ms. Cadbury will be attending a Local Tesco's in Brentford and Isleworth on Thursday to kick start their food collection between Thursday 30th November and Saturday 2nd December. Since 2012, over 30 million meals have been donated to help FareShare and The Trussell Trust support people in need across the UK. Last year, #givingtuesday broke a Guinness World Record for the most online donations in 24 hours as people gave $48 million to good causes globally, with the UK being the second largest contributor. #Givingtuesday now runs in over 70 countries including the US, Canada, Germany, Spain, Singapore, Australia, Tanzania, Russia and Ireland. It is led in the UK by the Charities Aid Foundation, one of Europe's largest charitable foundations which supports charities in managing their money and helps people and businesses give to good causes. The strapline for the campaign is 'do good stuff', encouraging people to do anything from donating money, volunteering, or simple acts of kindness that have huge impact. Charities, businesses and individuals can sign up to be part of the event at www.givingtuesday.org.uk<http://www.givingtuesday.org.uk> or connect via Facebook and Twitter. "I'm delighted to support #givingtuesday, supporting my local charities and encourage everyone in Brentford and Isleworth that is able to to get involved. It's a great event and an exciting opportunity for charities and businesses locally to showcase the work they do all year round. Hounslow Food Box in particular feeds so many and is in need of donations of non-perishable food and baby formula milk." 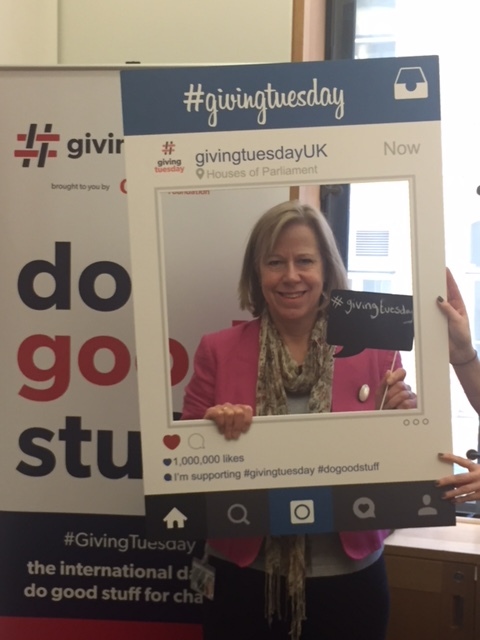 "#givingtuesday is a day all about giving back, and we're delighted to have Ruth Cadbury MP on board"
"The UK is one of the most generous countries in the world, and we at CAF are proud to run this campaign here - it's a fantastic opportunity to showcase all the great things that people and businesses are doing for charity."